2019 is a weird time for wellness. We’ve got Instagram gurus, Dr Google on call 24/7, diet teas that literally make you sh*t yourself and endless threads forever preaching the next miracle – did we mention all of this is accessible from a device that lives at the end of your arm? Reality is, this diet information overload has most of us more confused than ever. And, depending on how you’re affected, you’re either seriously decision fatigued, to the point where reaching for a bowl of cereal for dinner seems like the easiest out, or you’re spiralling down a rabbit hole of fad diets, that seemingly work for everyone else, but leave you feeling miserable, failing and obviously, hungry. Below, we speak to Amanda Archibald, registered dietitian, culinary genomics pioneer and founder of the Genomic Kitchen, ahead of her talk at this years BioCeuticals Research Symposium, to get a better understanding of her unique approach to “eating for your genes”. So, just as video killed the radio star, can culinary genomics kill the fad diet? Here’s to hoping. Trying to Figure Out What We should and Shouldn’t Be Eating Is More Confusing Than Ever. Why Do You Think a Personalised Approach to Eating Is the Way Forward? A personalised diet based on our DNA takes away the guesswork around which ingredient, or which choice of fat, works best for each individual. We each have a unique gene blueprint and the variations in our genes not only dictate our nutritional needs but can also be the reason some people find it harder to lose weight and others may be prone to gut problems. It’s why one-size-fits-all fad diets don’t work for everyone. Taking a personalised approach to diet provides you with the ultimate guide to food – right down to the nutrients you need and even how to cook your food for optimal health. Humans share 99 percent of the same genes and genes respond to food the same way in all of us. This being the case, there are some general food choices that we can all benefit from, assuming we have no food intolerances. For instance, certain herbs such as rosemary, oregano and thyme can turn on genes that produce antioxidants. Antioxidants perform damage control in our bodies by stabilising free radicals that are destructive to our cells and tissues. Spices like turmeric or ginger can reduce the activation of inflammatory genes – all beneficial for our health. Can You Give Us a Breakdown on What Exactly Is Involved In an “Eat for Your Genes” Approach? Don’t eat the same foods day in, day out. Each ingredient has a unique nutrition signature and variety is important. Try to choose a wide variety of food, mixing up cooked and raw ingredients, with an emphasis on cruciferous vegetables, such as broccoli, cauliflower and cabbage, herbs and spices. Eat seasonally, as each season brings its own unique nutrition signature through in-season produce. The gene SIRT-1 is the “master of the metabolic universe” because it interacts with a number of genes that can ignite our fat burning potential. Red grapes and even red wine contain the bioactive resveratrol, which can help activate this gene. Other foods provide the essential nutrients that ensure the smooth running of essential biochemical cycles in our bodies – one of these cycles influences how well your brain handles mood, anxiety and even sleep. So, add Brazil nuts, spinach, mushrooms, avocado, oranges, eggs and sunflower seeds to the shopping basket. There’s no need for exotic superfoods. Lentils and sesame seeds for example, have a large number of vitamins and minerals that support the work of proteins created by our genes and are needed for good health. Culinary genomics combines the fields of nutrigenomics (how food influences your genes) and the culinary arts. When genes are activated by nutrients, they hand over unique information that is translated into specific proteins. Depending on which system in the body you want to target, you can use food to deliver the information genes need to make those specific proteins – like an on/off switch for biochemical cycles in your body. Culinary genomics ultimately puts the right ingredients, prepared in the right way, onto your plate, ensuring the transfer of nutrition information to your genes. We now even know that steaming or quick stir-frying and even fermenting ingredients can ensure nutrition information gets to your genes while boiling and roasting can shut down information transfer. This is the power of culinary genomics. Why Can Our Specific Genes Mean That Fad Diets Just Don’t Work for (All) of Us? Variants in our genes determine not only how much of a specific nutrient (such as folate) we might need, but taking this a step further they also determine how we respond to different diets. Let’s take a look at the keto diet, which is so hot right now. While a keto diet may equate to weight loss for some, for others the initial weight loss may be accompanied by elevated levels of Triglycerides or “bad” LDL cholesterol, which is not healthy. 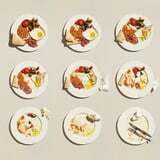 The fact is, some people can tolerate higher intakes of fat, including saturated fat, compared to others and that’s because of their genes. For instance, my own genetic make-up cannot tolerate the higher-fat, lower-carb focus of the ketogenic approach and it would not be good for my biochemistry over a long period of time. Other people respond differently. Genomics helps us determine at the most precise level a way of eating that is right for you. Your genes don’t care about fad diets, they care about how to create balance in your body.